Security men at a checkpoint on a road on Sunday. A strict lockdown was imposed around Kashmir valley’s main highway, which remained shut for civilian traffic for a second Sunday amid a heightened threat of a militant attack. The police and paramilitary personnel were deployed across the length of the highway and all roads leading to it were sealed off with rolls of concertina wires. Civilian vehicles were not allowed to move on the highway and even residential neighbourhoods which are only accessible from the highway were sealed off. The highway shutdown, which began last week, is an extraordinary security measure meant to safeguard convoys of security forces from the threat of suicide car bombs. As part of the shutdown on Sundays and Wednesdays, all civilian traffic is barred from plying the highway so that convoys of security forces are secured from the threat of militant attacks. The lockdown on Sunday, however, was unprecedented and created a sense of siege among the residents. 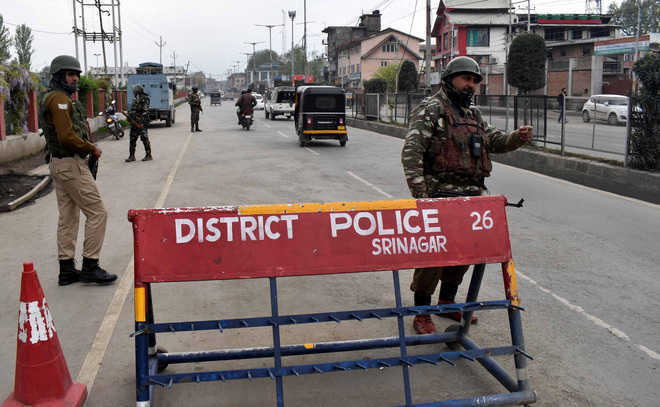 In addition to the roads leading to the highway, security forces also established checkpoints and blocked roads in the interiors of Srinagar city. An unconfirmed security advisory, an image of which went viral on social media sites, warned of a “strong” intelligence input about a blast on the highway. The advisory said the blast would be carried out using a motorcycle and directed a strict implementation of ban on civilian traffic. A senior police official refused to confirm the veracity of the advisory. The heightened state of alert, however, was visible on the roads of Srinagar and in the vicinity of the highway where large number of police and paramilitary personnel were deployed and motorcyclists were stopped at dozens of checkpoints. Mobile internet was also briefly suspended in the morning. The suicide car blast on the highway in Pulwama on February 14, in which over 40 CRPF men were killed, and another failed attempt near Qazigund town have stunned security agencies.